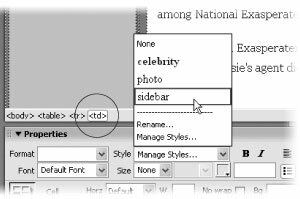 In this tutorial, you'll create an external style sheet for a Web page on the National Exasperater Web site. As usual, this tutorial requires some half-finished starter documents from the Web. Using your Web browser, visit www.sawmac.com/dwmx2004/ . Click the Tutorials link to go to the tutorials page. Then, under Cascading Style Sheets Tutorial, click the link for Windows or Macintosh, depending on your computer. When the files are downloaded and decompressed, you should have a folder named DWCSS on your computer, containing the Web pages and graphics for this tutorial. Now you're ready to begin defining a style sheet. In this example, you'll create a collection of styles for the headline news stories on the National Exasperater Web site. Add style to this rather plain Web page using Cascading Style Sheets. In this tutorial, you'll improve the rather ho-hum appearance of the left sidebar and main section of this page—the white area in this figure. Choose File Open; navigate to, and double-click, the file in the DWCSS folder called story1.html. 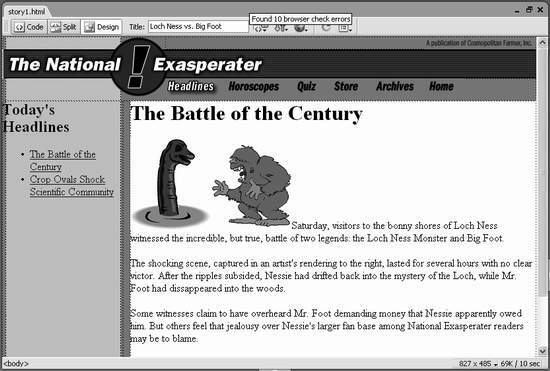 The Web page contains a headline news story from the National Exasperater (see Figure 6-24). The page's text is a bit boring looking, so you'll use CSS to spiff it up. To start, you'll create a style for basic paragraphs and create an external style sheet at the same time. If the CSS Styles panel isn't already open, choose Window CSS Styles (or press Shift-F11). The CSS Styles panel opens. On the CSS Styles panel, click the Add New Style (+) button . The New CSS Style window opens (see Figure 6-25). You'll first pick the type of style you wish to create. If you've already attached an external style sheet to a page, you can select its name from the Define In menu. That way, the new style will be added to that file. Your other option, which is what you're doing in this tutorial, is to create the new style sheet when you first create a style. This lets you create a style for a particular HTML tag—in this case, the <p> tag. In other words, you're going to create a formatting rule that applies automatically to every basic paragraph. Type p into the Tag box, or choose "p" from the menu. In the Define In section of the New CSS Style window, the New Style Sheet File option should already be selected (see Figure 6-25). The Save Style Sheet File As dialog box appears. You're about to create the file—an external style sheet—that will store the styles for this page. Navigate to the DWCSS folder. 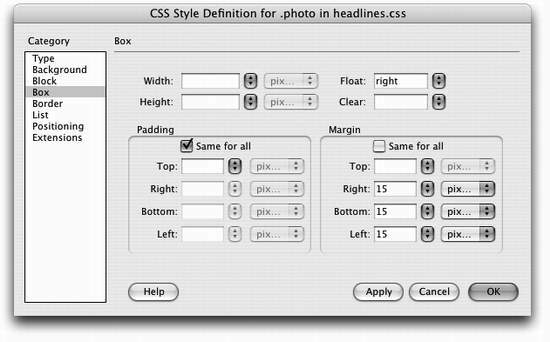 Type headlines.css in the File Name box (the Save As field on the Mac), and then click Save to save the file. Cascading Style Sheet files always end in .css; that's how Web servers and browsers can tell what kind of file it is. Having created the external style sheet, you can now create the first style, as suggested by the sudden appearance of the Style Definition window. You'll choose a font, set a size, and assign a color to the <p> tag. 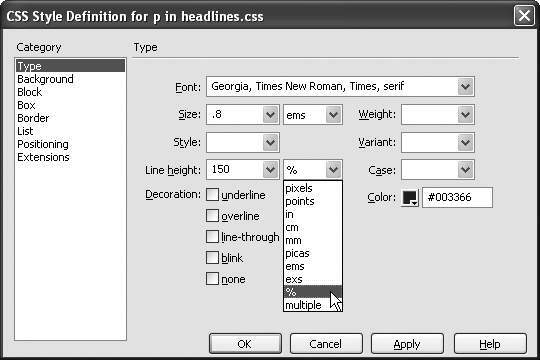 Choose "Georgia, Times New Roman, Times, serif " from the Font menu; type .8 in the Size box; select "ems" from the menu to the right; and type #003366 in the Color field. Next, you'll add a little leading (space between lines of text) to the paragraph to make the page easier to read. In the "Line height" box, type 150 and select "%" from the menu to the right. The Style Definition window should look like Figure 6-26. You can actually preview the look of a tag style without closing the Style Definition window—just drag it out of the way. The Style Definition window closes and the paragraphs of text on the page are now formatted according to the style you just created. As you may have noticed, you didn't have to select the text to apply this style. Since it's an HTML tag style, it's applied automatically wherever the tag appears on the page. Now, you'll create a style for the title of the story, which is an <h1> tag. On the CSS Styles panel, click the New Style button. The New CSS Style window opens. The Tag button is already selected, and the menu in the Define In option lists the new external style sheet?span class="docEmphasis">headlines.css. In other words, Dreamweaver will add the new style to this external style sheet. All you need to do now is identify which tag you want to redefine. Type h1 in the Tag box, or choose "h1" from the menu, and then click OK. The CSS Style Definition Window appears. From the Font menu, choose "Verdana, Arial, Helvetica, sans serif "; type 2 in the Size box; from the menu to the right, choose "ems"; in the Color box, type #669999. Click Apply again to preview the new headline style. What you've got so far isn't nearly sophisticated enough for the National Exasperater, so you'll add a background color and top and bottom borders to the tag. Choose the Background category list on the left side of the CSS Style Definition window. In the "Background color" box, type #FFFFCC. Or, if you prefer, select another color using the color box. You've just set a background color that will appear behind the text of any <h1> tag on the page. Next, you'll add snappy rules above and below the title. Click Border in the category list. The CSS Style Definition window now displays all the properties used to put a border around a style. You can control each border individually or use the same line style for all four edges. In this case, you'll add lines only to the top and bottom of the headline. Click to turn off all three "Same for all" checkboxes. From the Style menu, choose "dashed" for the top border, type 3 in the Width box, and type #666666 in the color box. Do the same for the bottom border. The window should now look like Figure 6-27. The window closes and the title of the story appears in its new formatting. If there had been other Heading 1 headings on this page, you'd see all of them change, too. The paragraph text is a tad too small, so you'll edit the <p> tag style you just created to make the text bigger. Click anywhere inside one of the paragraphs. Make sure the Tag inspector panel is open (choose Window Tag inspector or press F9). 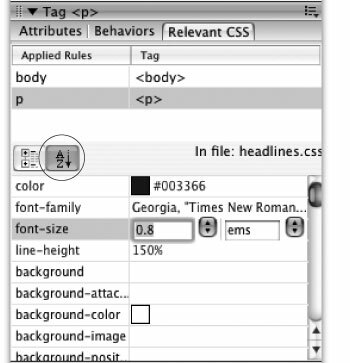 Click the Relevant CSS tab in the Tag inspector. The Tag inspector should now look like Figure 6-28. You can use the Relevant CSS inspector to edit already set properties or set new CSS properties for a style. You'll change the Font-size property. Click in the "font-size" box to select the .8 ems value. Type 1 and hit Return or Enter. The font size of the paragraph increases to 1 em. Another problem with the paragraphs is that there's no space between the text and the blue-gray sidebar at left. A little white space would provide some visual breathing room. Use the Border properties to add rules to any or all of the four edges of an object. You can give an image a stylish border, or underline a heading with this property. The Relevant CSS tab shows all styles that apply to the current selection (or current location of the cursor). In this case, two tag styles (body and p) apply to the current selection. You didn't actually create the body tag style; it already existed in an internal style sheet of the partially completed page. For this tutorial, make sure the List view button (circled) is selected. In the Relevant CSS panel, scroll down the list of CSS properties until you see a property named "margin-left." Not only can you use this panel to edit already existing properties, but you can add new properties—such as a margin—to an existing style. Click in the empty space to the right of the name "margin-left" and type 15. Hit Return or Enter to apply the change. The text moves 15 pixels to the right, creating a nice space to the left of the text. You can also edit a style by selecting the style in the CSS Styles panel and clicking the Edit Style button (see Figure 6-1). This alternate method opens the familiar CSS Style Definition window—the same window you used to create the style in the first place. You should use whichever method is most comfortable. Now you'll create a style to highlight the name of famous people mentioned in National Exasperater stories. This particular story deals with two well known celebrities—notice their names in the first paragraph. But since the names consist of just a couple of words within the paragraph, you can't redefine an HTML tag to format them globally. Instead, you'll create a class style, which you can then apply to the text. Click the New CSS Style button (+) on the CSS Styles panel. The New CSS Style window opens. This time you'll create a class style rather than an HTML tag style. Click the Class radio button. Type .celebrity in the Name box. Since you want to add the style to the external style sheet, you don't need to do anything else in this dialog box; Dreamweaver already proposes storing it there. Some beginners think that whenever you create a new style, you also need to create a new external style sheet. On the contrary, you can—and should—store more than one style in an external style sheet. In fact, if you're creating a set of styles for an entire site, put them all in the same external style sheet. The CSS Style Definition window appears. You'll add a few new properties to make this style stand out. From the Weight menu, choose "bold." To make this style even more prominent, you'll change its font color. Type #CC0000 into the Color box. Or, if you don't normally dream in hexadecimal notation, you can select a color using the color box. That's enough formatting for the .celebrity style. Now you'll return to the document and apply it. The Style definition window closes, but this time, nothing's changed in the document window. Unlike HTML tag styles, class styles don't show up anywhere until you apply them by hand. In the first paragraph, select "Loch Ness Monster." This is the first star mentioned in the story. From the Property inspector's Style menu, choose "celebrity" (see Figure 6-29). Boom—Dreamweaver formats the text with the bold, colored style. Now you'll style Big Foot's name. The Style menu in the Property inspector lists all class styles. It also displays the style name using the style's formatting—in this case bold and red text. Notice that only class styles are listed; tag styles don't appear in this menu since you don't need to apply them manually. 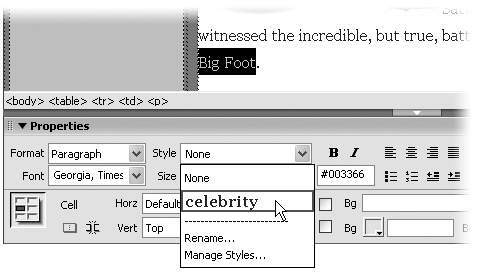 Select "Big Foot" in the first paragraph, and apply the .celebrity style to it, too. Your document text should look something like Figure 6-30. CSS Styles aren't just for text. You can create styles and apply them to anything on a page—tables, images, or links, for example. In this next section, you'll improve the appearance of the story image; specifically, you'll make it hug the right side of the page and add margins so it has some breathing room around it. The New CSS Style window opens. You could redefine the <img> (image) tag, but this would affect every graphic on your page. Since you only want to create a style for the main story graphic, type .photo in the Name box, make sure the Class style button is selected, and then click OK. The CSS Style Definition window opens. You'll first make the image float to the right edge of the page. Click the Box category at the left side of the dialog box. These properties affect margins, padding, and other attributes of a style (see Figure 6-31). At this point, the text in the page is coming along well. The headlines look distinctive, and you've achieved some effects (like the background color of the title) that only CSS can accomplish. Be careful not to confuse the Padding and Margin properties in the Box category. The Padding settings determine the amount of space between the styled object and its border. The Margins, by contrast, set the amount of space between the borders and other items around the object—in this case, the space between the photos and the text around them. From the Float menu, select "right." This option works like an image's Align Right property (Section 5.2.4); the graphic will snap against the right side of the browser window. But because text will wrap around the sides of the photos, you should add a little space between the edges of the photo and any text around them. The Margin properties are just the ticket. Turn off the "Same for all" box for the Margin property and type 15 in the Right, Bottom, and Left margin boxes. CSS lets you set different margin sizes for each edge of an object. Since browsers will automatically add some empty space below the headline, there's no reason to add any margin to the top of the photo. The Style Definition window should look like Figure 6-31. You're done with the style; now it's time to apply it. Click OK to close the CSS Style Definition window. To apply this new class style, you'll start by selecting an image. 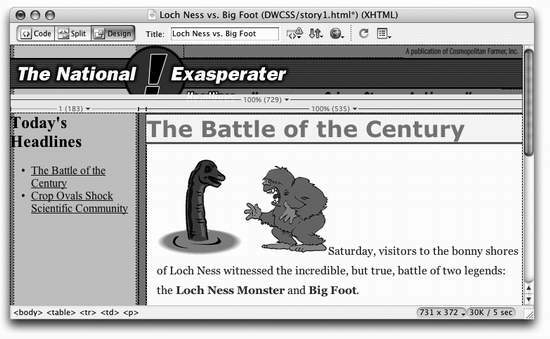 Click to select the graphic—the battle between the Loch Ness Monster and Big Foot. As you can see in the tag selector at the bottom of the window, clicking the photo automatically highlights the <img> (image) tag to which you'll apply the style. From the Class menu in the Property inspector, select "photo." Choose File Save. Press F12 to preview the page in a Web browser. Only 4.0 or later browsers display the CSS properties on this page. Depending on which browser you preview the page in, you may notice a white space above the headline "Battle of the Century." Some browsers, like Mozilla and Safari, add extra space above headers. You can get rid of this space, if you wish, by editing the <h1> tag style and setting its top margin property to 0. Now it's time to create a few styles for the left side of the page, which includes a heading and a list of links. You could create tag styles for the <h2> and <ul> tags used in this part of the page, but those would then affect the same tags in the main area of the page. They would then look like the sidebar, which is not what you want. Or you could use separate class styles, but then you'd have to apply them individually to each element. A better option, as described in detail on Section 6.6.3, is to use a type of CSS style known as a contextual selector (or descendent selector). First, you'll create a class style called .sidebar, which you'll apply to the tag containing all of the text in the sidebar region. Next, you'll create two contextual selectors to define how the <h2> and <ul> tags should look—but only when they appear inside the sidebar. Here's how to do it. The New CSS Style window opens. Click the Class radio button. Type .sidebar in the Name box. Dreamweaver will add the period before the style name if you forget. Dreamweaver also proposes storing it in an external style sheet, which is exactly what you want. Click the Box category to view CSS options for Padding and Margins. You'll add some padding to this style to create some space inside the cell, effectively indenting the text. Leaving the "Same for all" box turned on, type 10 in the Top box for the Padding property. Click OK to create the style. You've just added ten pixels of space around the inside edges of the style. But since this is a class style, nothing happens until you apply it. Click anywhere inside the left sidebar, and using the tag selector, click the first <td> tag (see Figure 6-32). Now that you've selected the table cell, you'll add the style to it. From the Style menu on the Property inspector, select "sidebar" (Figure 6-32). The text indents ten pixels. Next, you'll create a contextual selector to format the headline. Click the Advanced radio button. Type .sidebar h2 in the Name box. This syntax for a contextual selector simply means that the style you're about to create will apply to the <h2> tag (a tag style) but only when <h2> appears in the .sidebar style. In other words, it won't affect any <h2> tag outside of the sidebar. For accuracy, use the tag selector to select an HTML tag—in this case the <td> tag. You can then apply a style to the tag from the Property inspector. The CSS Style Definition window appears. In this case, you'll just make a couple of style adjustments, but feel free to try other style properties while you're here. From the Font menu, choose "Verdana, Arial, Helvetica, sans-serif." Type 1 in the Size box and select "ems" from the menu to the right. Click OK to create the style. The text "Today's Headlines" becomes smaller and changes to a different font. Next you'll fix the list, which is indented too far. Once again, click the New CSS Style button (+) on the CSS Styles panel. The now-familiar New CSS Style window opens. Click the Advanced radio button. Type .sidebar ul in the Name box. You're creating another contextual selector. It will apply to every <ul> tag (meaning unordered or bulleted list) inside the .sidebar style. The CSS Style Definition window appears. In this case, you'll adjust the font and margins used to display the list items. Select "Geneva, Arial, Helvetica, sans-serif " for the font and set the size to .8 ems. Since the sidebar on this page is rather skinny, the standard indent that Web browsers add to bulleted lists is too broad for this list. You'll adjust that space using the padding and margin properties. Click the Box category and turn off the "Same for all" box under both the Padding and Margin properties. Then type 10 in Left box for both padding and margin (see Figure 6-33). Click OK to create the style. The bulleted list changes font, but the indent doesn't look so good. That's just Dreamweaver being finicky. When you preview the page in a real Web browser, you'll see that the indent looks great. Choose File Save to save the page. Press F12 to preview the page in a Web browser. Only 4.0 or later browsers display the CSS properties on this page. Your finished page should look something like Figure 6-34. Adjusting the margins for both bulleted (<ul>) and numbered (<ol>) lists doesn't always work. To assure the most consistent experience across browsers set both the padding and margin properties. Now that you've created these styles, you may be wondering how you can use them on other pages—after all, that's the beauty of external style sheets. Once created, it's a simple process to add a style sheet to other pages in the site. Choose File Open. In the DWCSS folder, double-click the file story2.html. This is another headline story for the National Exasperater. It has no formatting yet, so you'll attach the external style sheet you just created. Click the Attach Style Sheet button on the CSS Styles panel (see Figure 6-1). The Link External Style Sheet window appears. The Select Style Sheet dialog box appears. 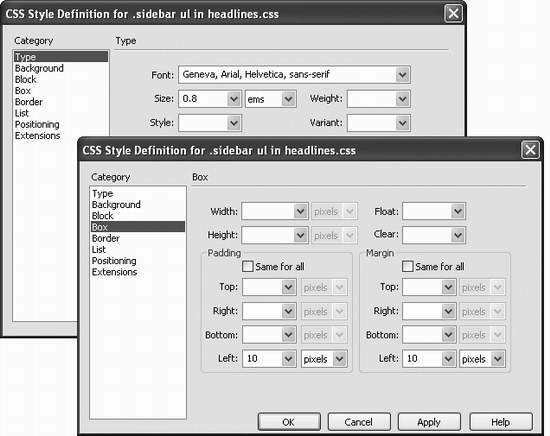 Navigate to the DWCSS folder and select the headlines.css file. Click OK to insert the path to the Link External Style Sheet window. Click OK to attach the style sheet to the page. 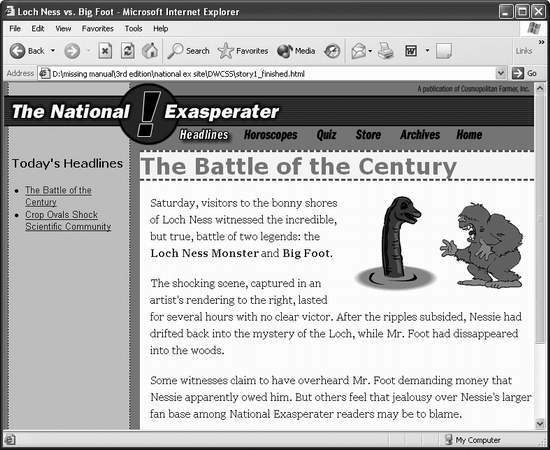 Dreamweaver instantly formats the top headline and main text of the story. Pretty cool—and very efficient. You only need to apply the .sidebar class style to the left table cell to format that text as well. Click anywhere inside the left sidebar, and in the tag selector, click to select the first <td> tag. Next you'll add a style to the tag. Cascading Style Sheets let you explore lots of visually interesting design choices. Select "sidebar" from the Style menu on the Property inspector (Figure 6-32). All of the text in the sidebar is instantly formatted. Press F12 to preview the page. If you'd like to compare your finished product to the professionally completed version, visit www.sawmac.com/dwmx2004/tutorials .